Information and background about the critters and the species that we study. For facts about study sites and habitats, see Habitat — Sites. After barely surviving more than a century of direct assault as a gourmet meal, an already declining Northern diamondback terrapin population is today suffering continuous loss of habitat all along the Atlantic Coast. As more and more development occurs on salt marshes, estuaries, tidal rivers and coastal bays, nesting sites are lost to homes and driveways and roads and seawalls and landscaping, diversity of food sources declines, and water quality deteriorates. 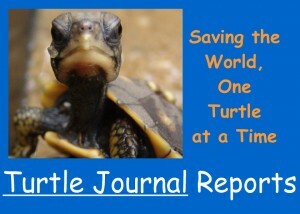 The result has been steadily dropping terrapin populations from Massachusetts to Texas, except in isolated areas where there have been intensive efforts to conserve habitat and to protect terrapins. Still, this video clip represents a metaphor for terrapin survival: swimming against the tide. As soon as conservation eforts slacken in any estuary system, a collapse of local populations is the outcome. Since terrapins are non-migratory, once a local population is extirpated, the species disappears forever. The future of terrapin survival is spring-loaded to ”OFF” (extinction) and we must remain ever-vigilant in applying pressure to wedge the survival “switch” into the ”ON” position.